I was going to let this go. After all, patients waiting in the clinic for an appointment have enough to worry about without fretting over an improvised sign. But then the latest copy of “Bicycling” came in the mail, making me think that silence is not an option. Somebody has to speak up. Speak up about what? About the spreading plague of apostrophe misuse, of course. 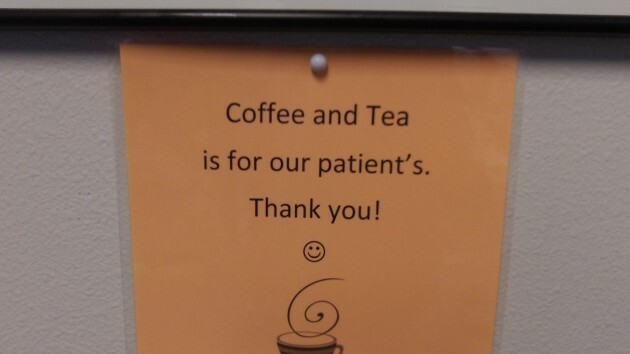 Yes, it says “clears,” suggesting that the copy writer shares not just ignorance of apostrophes with the sign writer warning non-patients to stay away from the refreshments. They also have in common a disdain for number agreement of subject and predicate. I guess we can be grateful for the properly placed apostrophe in “isn’t” and overlook the number problem. But I’m thinking that for a national magazine, basic English should not be that much of a challenge. I am sure your overreacting. Freshman English Literature. 1981. First essay. I mis-used “it’s” or “its” — not sure which after all these years. Paper is returned with writing on the front page stating that this is my only pass. If I mis-use it again, it’s an automatic F. That was his policy for all students — I was not singled out. Turns out I liked the professor and took him for two full years of literature. I never mis-used it again– at least in his class. I’ve mis-used it more than once on the web of course, where there is less chance too review and edit. Ahh, grammar and punctuation. The mainstays of English teaching in 50’s grammar school. The proper use of synonyms “it’s ,its, two, to, too, your, you’re” were drummed into our little noggins. And while seeing eye floaters isn’t a reason to panic, in some cases, you’d be right to call your doctor; Eye floaters can also be a symptom of a more serious eye condition.